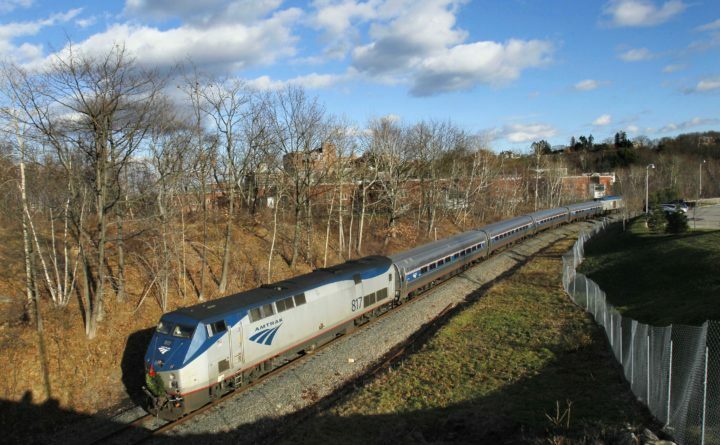 In this Dec. 8, 2011, file photo, the Amtrak Downeaster passenger train travels through Portland, Maine. Quinn’s remarks come after a Monday report posted online by Trains magazine suggested any rail lines without positive train control could lose their Amtrak services by the end of this year. The Downeaster services parts of Massachusetts, New Hampshire and Maine, where it has stops in Wells, Saco, Old Orchard Beach, Portland, Freeport and Brunswick. Positive train control is an automatic braking system that uses sensors along the tracks to monitor speed in tandem with an on-board computer system, according to CBS affiliate WGME. In accordance with a federal mandate, Amtrak is working with rail owners and carriers to install and implement positive train control technology across its network. However, some lines, such as the Downeaster, are exempt from the federal mandate, and some have qualified for an extension from the Dec. 31, 2018, deadline. “For those carriers and routes operating under an extension or under an [Federal Rail Authority]-approved exemption, Amtrak is performing risk analyses and developing strategies for enhancing safety on a route-by-route basis to ensure that there is a single level of safety across the Amtrak network,” Amtrak spokesman Marc Magliari said in email. Quinn said that because positive train control technology is not required on the Downeaster line, New England rail authority is “not considering” installing the technology at this time.